I can’t believe how long it’s been since I last saw Paul Simon, but there was a cancelled Bournemouth gig in-between after he lost his voice at Glastonbury. 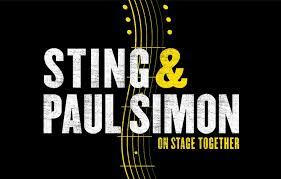 At first sight, Paul Simon and Sting seemed an unlikely pairing, though both have had double careers; group, then solo, and they were the songwriters in both. Both are fond of reggae rhythms and world music, both are painstaking lyricists, and Sting songs like Shape of My Heart sound like Paul Simon. As a listener I know every word of everything Paul Simon wrote, but with Sting and Police I’m more attuned to Greatest Hits, though I have four Sting albums, two Police and half a dozen Police 45s. So, not a completist, but interested. 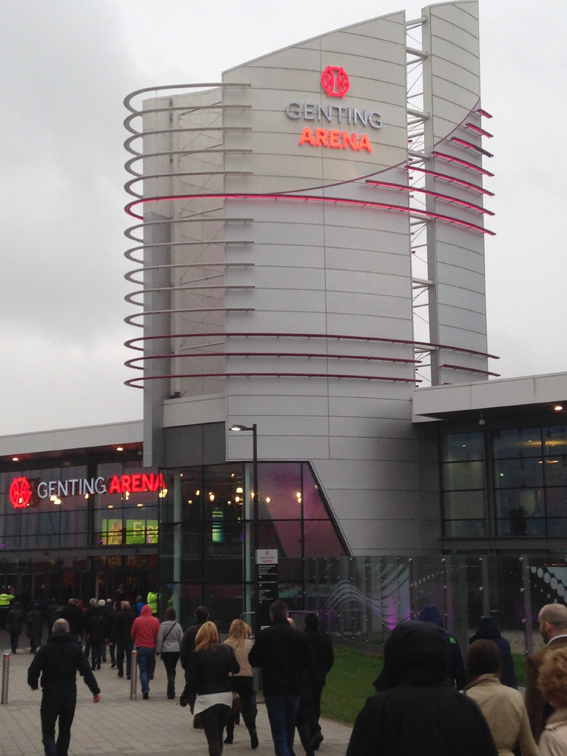 The venue used to be called the LG Arena, but is now the Genting Arena, which might be with a hard G or a soft G. It’s not an attractive-sounding name in either version, and is part of the NEC, or National Exhibition Centre out on the M42 Birmingham ring motorway. Getting in used to be a nightmare years ago with the world’s worst signposted routes. It’s even worse now. By the time we’d found our hotel we’d vowed never to come here again. We were lucky to manage to walk back to our hotel afterwards, as the signposts, awful for drivers, are non-existent for pedestrians. Fortunately, the security guys are helpful and used to giving directions. It’s huge. A large section directly facing the stage was empty, but that was because the camera operators would have obscured their view, but there were small blocks of empty seats dotted around here and there … greedy ticket agencies grabbing seats and being left with them as usual. You do need camera operators when in graphic artist terms, our stars were the size of a half thumb held up in front of you. The camera director is a guitar aficionado with the default cut being to a tight close up of a guitar. I got quite confused in the first song because the camera kept switching from Sting’s face in close up to a tight close up of a very battered sunburst Stratocaster. Is he playing 6-string guitar I thought? Even at that distance, the manikin I could see appeared to be holding a battered sunburst Fender bass guitar. I finally realized that the cut was continually to Dominic Miller’s guitar in tight close up (but not to Dominic Miller). Confusing. The camera also favoured backing singer Jo Lawry throughout the first two numbers, well, I guess she was the only female, but it had the irritating effect of focussing the viewer on the backing vocal instead of the lead vocals. The camera operator was less obsessed later. They both brought along their fantastic bands which means 17 musicians on stage, which is why it has to be these cavernous arenas. The two bands are listed separately in the programme. The programme reads Paul Simon & Sting one way, then if you turn it upside down and start from the other end it reads Sting and Paul Simon. In spite of the separate listings, there were times when both bands played together (and to be frank, the sound was a little muddied when that happened … too many cooks), but mainly it was one or the other. There was considerable cross-fertilisation between bands, So Sting’s backing vocalist, Jo Lawry, backed Paul on a couple of songs. David Sancious is listed as Sting’s band, but played the piano part in Bridge Over Troubled Water, while Paul’s keyboard player, Mick Rossi, moved to Hammond organ. The horn section are listed with Paul, but played on a lot of Sting’s material (notably on Desert Rose). The opening set was both Sting and Paul Simon singing as a duet, starting with Sting’s Brand New Day and moving into The Boy in The Bubble with both bands blowing. The sound improved markedly on Fields of Gold, perhaps the sound crew were getting the full venue sound worked out, but more likely because there was less going on. Fields of Gold had them swapping lead vocals, and like Fragile later, it’s a Sting song that really really suits Paul Simon’s voice. But Fields of Gold is an exquisite song anyway … both in the original Sting version and in the Eva Cassidy cover. It was one of the highlights of the evening for me. A lively Mother and Child Reunion finished this first set of four, and Sting’s battered Fender bass propelled it well. The way they slid on and off stage without any breaks was well rehearsed. 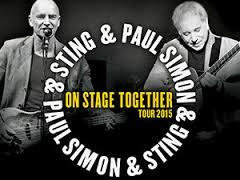 Paul Simon suddenly was no longer there and we were into Sting’s solo set. If you think back to So Lonely as a fairly raucous Police single, you’ll be unprepared for the long magnificent tuba solo by Marcus Rojas. Then Sting did the extravagantly titled When The World Is Running Down You Make The Best of What’s Still Around. Next, Englishman in New York had the virtue of familiarity, greatly enhanced by an astonishing sax solo. The gentle pace allowed the sound to breathe too, again less happening aurally, but more effectively. Shape of My Heart was beautifully balanced … again not too much going on, great violin, and this one interested me as one of Sting’s songs which would have worked well with Paul Simon singing it (not that he did). Driven To Tears is a lesser-known Police song, but here it ended with wild, wild fiddle playing by Peter Tickell. Walking On The Moon was the perfect crowd-pleaser to finish the segment. Paul Simon just appeared from nowhere, his musicians slipped into place, and without a pause they were into Mrs Robinson, sung together, with a prominent lead guitar part. A couple of reviews dating back to last year’s North American tour have highlighted the version as bluesy and even as the highlight. I thought it had lost some of the essential bounce of earlier live versions. Paul Simon’s solo segment started with 50 Ways To Leave Your Lover, and Jim Oblon on drums and Jamey Haddad on percussion did an excellent job … that drum part was one of Steve Gadd’s signature moments when he played with Paul (and of course on the original track). Dazzling Blue was, regrettably, the only song in the evening from the last four albums. That’s a pity, especially as it’s such a wonderful piece, here augmented by Jo Lawry’s backing vocals. Graceland followed … there were five songs from the Graceland album tonight. Other shows in the tour had six. I guess if you have Vincent Nguini on guitar and the incomparable Bakithi Kumalo on bass you’re going to make the most of their presence. And it is his greatest album. For Still Crazy After All These Years, Paul abandoned his guitar, and sang up front with his hat on, and his hand movements he looked and sounded like a 40s torch singer … more appropriate for covering Frank Sinatra songs than Bob Dylan recently, I thought. Sorry to Dylan fans, but Paul Simon is a contrast in still having his full vocal ability on stage. As I listen, transfixed and transported, I think of all my years of writing about Dylan and The Band, and wonder if the time had been better spent on Paul Simon. I’ve never seen a less than five star performance from Paul or his musicians. He’s been far less prolific, but much more meticulously crafted. Me & Julio Down By The Schoolyard is a total contrast, livening everyone up. Sting then came on and they did Fragile, and it was one of the stand out songs of the entire evening, as Sting played six string acoustic guitar (superbly too) and Paul sang it. Then Paul moved to the side, and this time Sting sang Paul’s America with close up spotlight, and made a first-rate job of the lyric and melody too. I spent so many years using it for English teaching that I know it backwards, forwards and sideways, both in the Simon & Garfunkel song from Bookends, and later Paul solo versions. Actually, I do wish Paul would visit Bookends more often and more extensively. Sting launched into Message in A Bottle and for the first time we were grateful to be high up in the side gallery because it instantly brought the flat seating area to its feet, and had we been down there, we wouldn’t have seen a thing. It was my companion’s favourite song of the entire evening, and great to hear with a full band. The Hounds of Winter and The End of The Game both utilised a large band. The End of The Game had a welcome spoken intro about fox hunting (the song’s subject) from Sting. It made us realize that neither had said much until that point. I thought The End of The Game was improved in this version. Roxanne naturally had red lights playing over the audience, and segued into Bill Wither’s Ain’t No Sunshine (I think he likes playing the bass part) and back to Roxanne. Next, Desert Song is hard to do in the absence of the original Algerian co-singer, but Jo Lawry filled in and the horn section were full of Eastern Promise (as the Fry’s Turkish Delight TV advert used to promise). 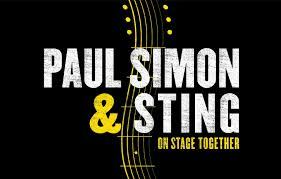 The Boxer brought Paul on to sing a duet with Sting. The Moog solo was replaced very well with a trumpet solo. The sound of thousands “La La Lying” is a joy to hear, though I was a bit perplexed by the clapping along to the beat for the first minute … then it died away as people realized it was inappropriate to the song. I think the louder stuff from Sting’s set had got people over-excited. Paul resumed solo with That Was Your Mother … I noticed Bakithi Kumalo had switched to electric stand up bass, and Jamey Haddad added a “chest percussion” solo with a metallic washboard strapped around him. The accordion was magnificent. Cool Cool River was radically re-arranged, and as we both said afterwards,radically fucked up too. The sound balance was poor and Paul’s mic barely audible in sections. Though there were somewhat muddy bits at the start of the show, it was the only bad sound all evening. The mix grated, Paul was swamped, the lovely lilting melody went walkabout. Leave screwing up your own great songs to Dylan! It’s the first time I’ve heard Paul do it. He got it back right away with the title track from Hearts & Bones, my second favourite album (just) and my favourite song on it. Hearts & Bones was beautifully sung, sparse but perfect accompaniment and a return to excellent sound mixing. He paused briefly and did a short but sweet Mystery Train, and then let the band take over on Wheels. Wheels had drummer Jim Oblon switching to electric guitar to play lead guitar. He had played acoustic guitar earlier too. Wheels is an odd choice of cover in the UK, where the original String-A-Longs hit (written by Richard Stephens and Jimmy Torres of the String-A-Longs, with credit shared by Buddy Holly’s producer, Norman Petty) was eclipsed by the much later Joe Loss Orchestra’s Wheels Cha-Cha. Joe Loss (aka Dead Loss)’s rendition was used by “Muscle Man” Tom Holland who stood and rippled his muscles to it on a TV Talent Show for weeks and won. So it is the height of kitsch. In the USA it might be a cool guitar group instrumental. Not here. Sting should have told him. Someone should also have told Paul that it was not “written by the great Chet Atkins” as he announced. It was a #3 US hit in 1961, and a #8 UK hit in the original version. Yes, Chet Atkins covered it, and that may be where Jim Oblon learned it, but as a songwriter Paul Simon, dates back to 1961 and so should get it right! While it’s embarrassing to be too knowledgeable on early 60s guitar instrumentals. Wheels has an interesting and disputed history and I once did an article on it. It led into The Sounds of Silence, performed solo by Paul with just Mark Stewart (I think) on cello accompanying his guitar. I looked at several setlists from earlier in the tour, and we lost Gumboots in Birmingham, but gained Sounds of Silence which got massive applause, so a good call. Maybe it was a call directed at England where the Paul Simon Songbook was recorded 51 years ago. The Diamonds On The Soles of Her Shoes / You Can Call Me Al medley has been the high point of Paul Simon shows for years, though this time there was a very slight gap between the two rather than the linking long drum solo … we still got the solo, but a pause. The South Africans added vocals, and the two songs were a masterclass in bass playing from Bakithi Kumalo, who switched to a 5 string fretless bass guitar. The bass solos were longer, there were more of them, and Paul brought him to the front to round off You Can Call Me Al. That’s always been the break point before encores. I always find my ears drawn to bass, so an evening with Bakithi Kumalo AND Sting playing bass guitars is perfect for me. Sting is one of the great singing bassists. 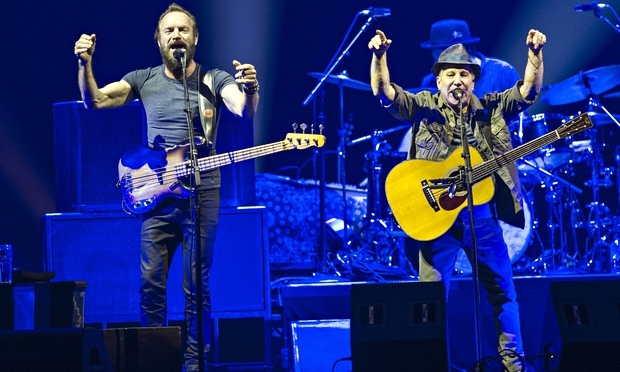 As with the first four songs, the encore four were done as a duo, opening with Cecilia from the Bridge Over Troubled Water album, with Sting in the Art role. They duetted on the hypnotic Every Breath You Take which is insiduous and catchy, but in spite of being hypnotized by the melody, my companion calls it ‘The Stalker song’ and has always found the lyric unpleasant. No matter,it was an excellent rendition. Then the big one. Bridge Over Troubled Water. David Sancious on piano … and Sting taking the first verse, Paul the second and duetting on ‘Sail On Silver Girl …’ that really is a challenge. Even Garfunkel finds it a challenge nowadays, but Sting carried it off powerfully. The band(s) took their united bows, then we had a duet, just the principles with guitars. Paul Simon, like Paul McCartney, has always acknowledged The Everly Brothers, and they accompanied Simon & Garfunkel on the 2004 tour. Tonight it was When Will I Be Loved? yet another great song among dozens they could have chosen. Rather a low key closer in fact, but they might know it’s a good way to close the show down, and also it’s too quiet to generate excessive stamping for more. After over three hours we had certainly had our money’s worth. Two shows in one. Sound? It’s an arena. The musicians were largely very clear and there were many interesting and brilliant solo spots. As mentioned earlier, dealing with 17 instruments, including two drummers, a percussionist, two bass guitars, four guitars, horns, two keyboards, up to five people singing is a major task, so all credit to the sound they got. I thought they had three soundboards, though I can’t be sure. One major fault, which happened about four or five times, was Paul Simon’s mic. I’ve seen him several times, his mic technique is impeccable. But repeatedly we lost half or all of the first line of a song then it came to life. You could actually hear the volume coming up during the line. With that much going on, it’s normal to kill unused mics to stop bleeding from all the other instruments. That means bringing them back up when is needed, and they kept doing it half a line late. Poor rehearsal? Unlikely given the tour length. Inattentive or new operator? I don’t know, but they also screwed up Paul’s mic in The Cool Cool River. Sting came out particularly strongly, the first time I’d seen him. The Police songs were powerfully enhanced by a wider musical palette, and his solo material shone. I loved the swapping of songs between them, the interplay and obvious friendship. Both are Libra too. They should do a DVD set, and the things which will stick most for me are the crossovers: Paul Simon’s voice adding to Fields of Gold and Fragile, and Sting’s superb takes on America and Bridge Over Troubled Water. Most of the audience was fifty plus, certainly around us. I thought that sad in that the show would have enthralled a younger demographic, but then again it’s an expensive evening, particularly if you have to travel. Interestingly, the 60s generation who loved Paul Simon in the early days (which includes Sting himself, as he said on stage) have blended with those a decade younger who were growing up with The Police – of course, Andy Summers and Sting were already in their late twenties by the time the band took off, and I’d watched Andy Summers (or Somers as he then was) a dozen years earlier with Zoot Money. Anyway … It’s quite hard now to see the difference between the 60s and 70s generations! We depart Birmingham with a degree of relief. I have been there a little over half a dozen times but have had horrific vomiting etc there three times. To be fair, I know I picked up one up from as pie on the motorway at Stoke On Trent, and another was a virus from our grandkids acquired in Bournemouth, but released in Birmingham where I was at a conference. The third was a meal in a central Birmingham hotel. So it’s two-thirds coincidental, but nevertheless colours my view of the place and we were pleased to be just out on the ring road.